Visualize the road ahead and map your career. Decide where you want to go in the bio-economy. Knowing potential career paths and options results in a stronger career plan. 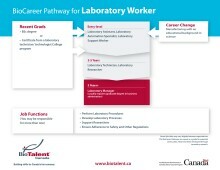 Use the BioCareer Pathways to identify where you want to go in the bio-economy workforce. The BioCareer Pathways are a guide for potential career paths. They have been developed through exhaustive secondary research and provide the latest available information.